Nothing delights me more than talking about organic to a wide audience, but in your piece, Organic vs Conventional: Have you been robbed?, you are taking aim at the wrong target. Much like the person who frets over which china to use while the house is on fire, you take organic– which accounts for 2-3% of food sales– to task while ignoring the rest of our food system. Organic consumers have certainly not been robbed. On the contrary, they’re reaping the documented and well-researched benefits of choosing organic, both in terms of their own health and the health of the planet. The victims of a robbery here are consumers NOT choosing organic. I’m personally inviting you to be my guest at a screening of FOOD Inc. a new documentary debuting next month that explores exactly what Joel Salatin and others are talking about. Joel appears in the film – as do I, along with Michael Pollan and Eric Schlosser – and what you’ll learn is that we’ve all been hoodwinked, but not by organic. We’ve been misled by a food system, controlled by a very few, that mass-produces our food. The result is cheaper food, but also mistreated animals, exploited workers, farmers who are criminalized for working their own land, and consumers who don’t know what’s really in the food sitting on their dinner plate. FOOD, Inc. also holds out the hope that organic is a solution, since it can offer an equitable system for workers, farmers and consumers. The USDA organic label is reassurance that what they’re eating is grown without the use of toxic and persistent pesticides and fertilizers…that the cows producing organic milk are not pumped with artificial growth hormones to speed up milk production and shorten their lives …that the land on which those cows graze is not saturated with chemicals and carcinogens that seep into our water and pollute our air. We’re proud that Stonyfield’s organic ingredient purchases — those include fruits, sugar, as well as organic milk — support 100,000 acres of organically-managed farmland. Thanks to organic practices, those acres feature healthier soil, greater biodiversity, higher water quality, better yields, and more humane animal treatment — and organic dairy farmers are being paid more to boot. After more than 25 years of environmental activism and a life and career dedicated to organic, I can assure readers organic IS better. 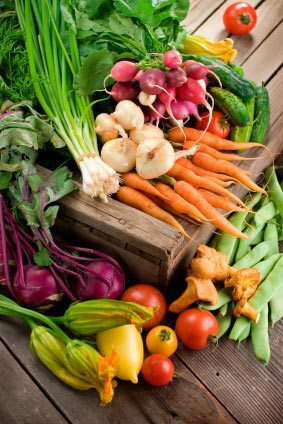 Even when it comes to health – research finds organic fruit and vegetables contain up to 40% more antioxidants than non-organic varieties, and studies show a range of health concerns related to pesticide use, from stillbirths to diabetes to Parkinson’s disease. The fact is organic offers a gold standard few can match. Better still, it’s the promise of a healthier planet and a system of sustainable agriculture that supports family farms. Joel Salatin said it best in FOOD Inc.: “I am amazed at how successful we have been (in this country) at hitting the target of the wrong bull’s eye.” Those of us who care about having a sustainable food system -and you obviously care a lot—have to keep our eye on the right target. Gary Hirshberg is Chairman, President and CE-Yo of Stonyfield Farm. And here is stephan colbert with michael pollin…. and here’s why you can’t trust the corporations when it comes to food safety….